If you are getting married, or in a bridal party soon, we have the ultimate detail on the most stylish bridesmaid’s dresses around for 2019 & 2020. There is no better occasion to be timelessly stylish than your or a loved one’s wedding day. 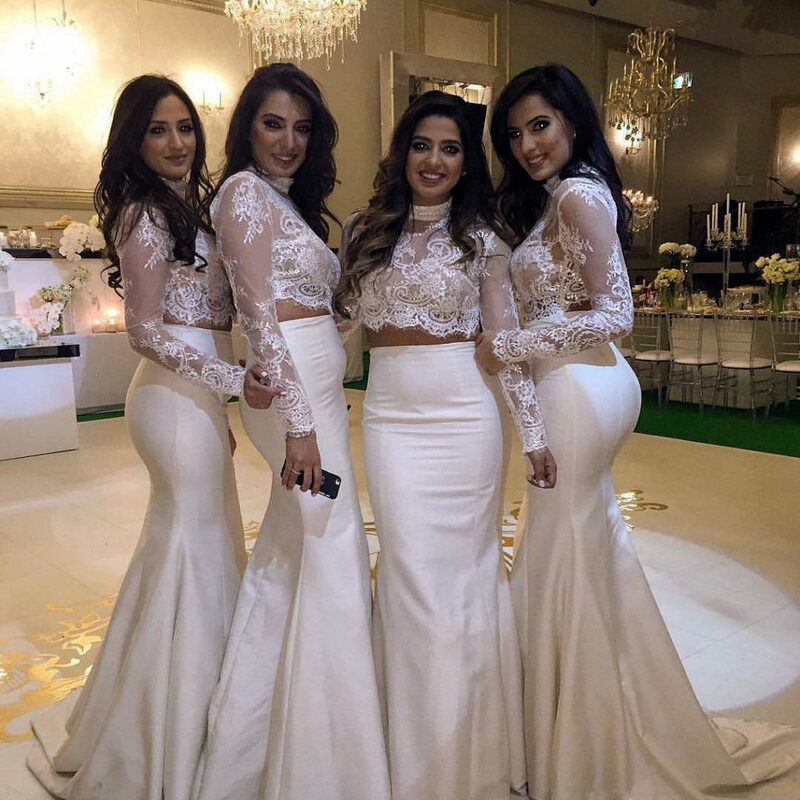 With this in mind, we have brought together a list of the most stylish bridesmaids dresses you could wear now, that will still look beautiful and fashionable come 2050. Start your relationship off with a statement. 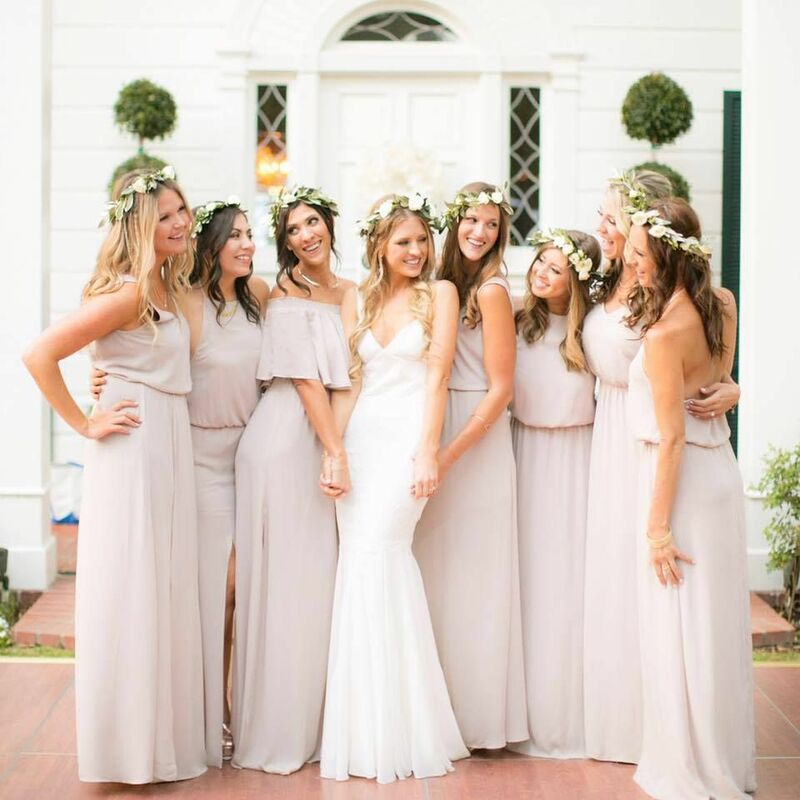 An all gold bridesmaid group is luxurious, stylish, and possess an old hollywood glamour if it’s done right. Plus, these stylish bridesmaid’s dresses are so in for 2019 & 2020. These gold dresses give a gorgeous hollywood look with the slit and trailing length. There is also a modern twist to them in the halter style neck line and we’re into it. Perfect combination! Imagine these with a hair dramatically pinned back on the one side, with flowing vintage curls on the other. You can actually grab it here for under $200! These dresses bring a bit of the 1920s era into the 2000s, which would seamlessly travel into the late 2000s with their unique style. And set against a backdrop of green and palm trees, it just looks so perfect! Here, they don’t have as much old school hollywood , but the bright sequined dresses are a perfect contrast for an outdoor wedding on the water and have all the glamour. Just look at how they shimmer in the sun! Gorg. If you prefer not so many sequins, a nice silk dress can still give you all that gold glamour you need. Just make sure the dress is in a classic silhouette to help give you the right look. Or you could just go all out with a metallic mix of gold and silvers and copper, each dress in a different style and color. This makes for a much more interesting group, at the least. We’ve noticed a big increase in ladies do a mix and match bridal party, like shown earlier. This is where each bridesmaid goes well with the others, but is a different cut/style and oftentimes a total different color. 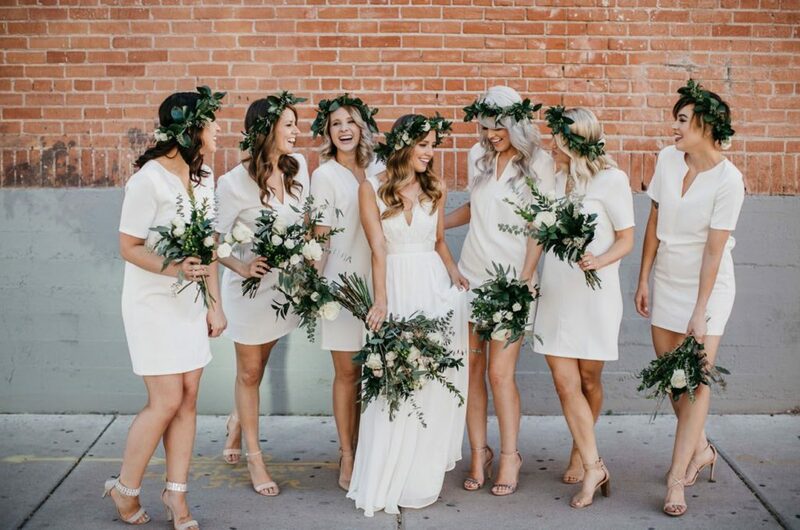 We see a big trend in the 2020 & 2019 stylish bridesmaid’s dresses with this new tradition. As you’ve seen just before, you can mix and match the metallics, but here are a few other options too. These dresses are all the same color, and they have all the same line from high waist down. This brings only the necklines to be different and creates a still seamless look, but with some subtle variations. This is great if you want your girls to shine their own personality, but still need a cohesive look for your tastes. Here we have a more drastic change throughout the bridesmaids. These girls have different colors and shapes, some with straps some with none. These dresses are all still in the same color family, however, and don’t distract the eye too much. This group has different colors, patterns, and necklines! These colors work great and compliment each other, which that and the length is the only thing keeping the group looking like a group, so be careful while choosing. This can look unique and stylish and keep everyone happy with different choices for their outfits. These ladies look to be all in the same exact dress cut, but with totally different colors and patterns. The cut of a dress is another great way to uniform the party without stifling each ladies independent style. Now this look brings everyone in a totally different color and cut, but it still looks great! This helps if you keep all the colors in the same tone. For example all these tones are a very deep version of the primary color, you could also do the pastel version of the color, ect. Another one that can bring out the timelessness of the old school hollywood glamour is a long sleeved dress. Long sleeved dresses can be great with a long hem, or short and can also become sultry without showing much skin! Long sleeves tend to look great and slender on everyone, too. The long sleeve look is one of the most stylish bridesmaid’s dresses for the 2019 & 2020 season. This is a great example of a modern long sleeve dress, or one sleeve rather, that will look good on nearly every bridesmaid. The see through lace sleeves give the dress more details and a memorable look for your wedding picture for years to come. We’ve seen this style with two sleeves, also. This beautiful deep burgundy pairs well with the wrap dress style and light bouquets. A wrap dress is a great option too, so that everyone can find a great fit without altercations except for maybe the hem length. The deep v in these dresses end up being the only skin showing, but is the perfect amount. Very classy and timelessly beautiful. An even more glamorous look is to bring the long sleeves off the shoulders. Add this lace detailing and curve hugging bodycon fit and you will have the bridal party styling! For our last long sleeve dress ideas, we’ve brought in the two piece! Perfectly comfortable for your ladies, and unique! They tend to be much easier for people to get the right fit without needing altercations, too. This set looks gorgeous with the white over lace on the top, we think adding a glitzy belt would be even better. You’re ladies will have the most stylish bridesmaid’s dresses in all of 2019 & 2020! And if you’re staying in the traditional bridesmaid dress arena, but still want to have a little fun, look into flower crowns. These are huge for the bridal season of 2019 & 2020. There are a few different variations you may like. Do be careful, this look is not as timeless as others and will show the era off quite well as you look back at the photos later in life. But, the more beautiful flowers the better! Having the crowns perfectly match the bouquet is a great way to bring more floral and colors into your bridal party. 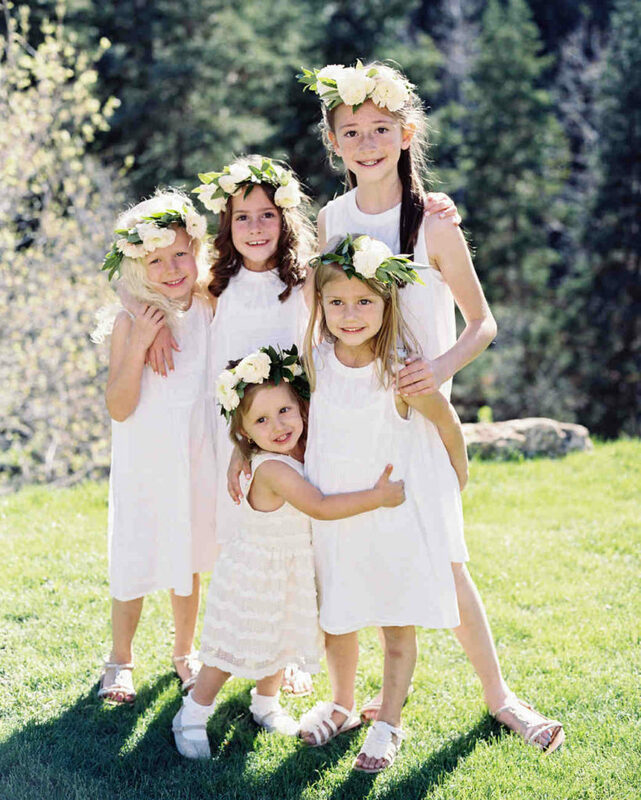 And if you don’t want to go all out with the bridal party, a great option is to flower up the flower girls instead! Look how cute that is. Do you have more stylish bridesmaid’s dresses for 2019 & 2020? Give us a comment to tell us what you’ve found. In the meantime, if you and your ladies are looking for some fun bachelorette party ideas, check out our last blog of ideas just for you!